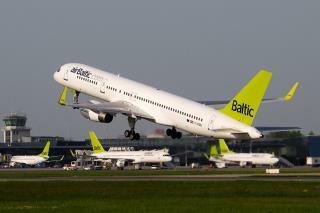 (Newser) – Too drunk to fly, and possibly too drunk to walk: A co-pilot who went on a drinking binge with three other airBaltic crew members hours before a flight was found to have a blood alcohol level around seven times the legal limit, the BBC reports. The 38-year-old told a court in Norway that he and his colleagues "lost control" after going out drinking in the afternoon and were still boozing at 2am, four hours before departure time, although they did switch from whiskey to beer at some point. The crew was breathalyzed after an anonymous tip before their Aug. 8 flight from Oslo to the Greek island of Crete, and authorities found that the pilot, co-pilot, and two out of three flight attendants were over the legal limit. Get high to fly high. I am surprised that co-pilot was still alive. Even if he wasn't part of the crew, they still should not have let him on the plane. With that much alcohol in his blood he could have been a fire hazard. Seven times the legal limit to fly, not drive. .56 equals death!